The 13th Annual Inaugural Lecture of the Polytechnic presented by Dr. Ajayi M. A. (Dean, School of Applied Sciences) titled "Abundant Life Ahead of Academic Retirees"
Federal Polytechnic Ede Innovation Team develops first ever tertiary institution Student Information Management mobile app. 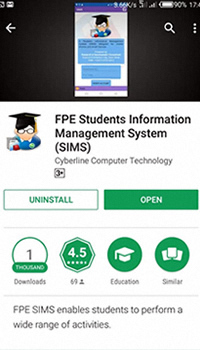 The app popularly known as FPE-SIMS is available on Google Playstore for download and is compatible with all Playstore enabled Mobile phone. Desktop and Laptop Users can use the app by downloading the latest version of Bluestack and WPS office. 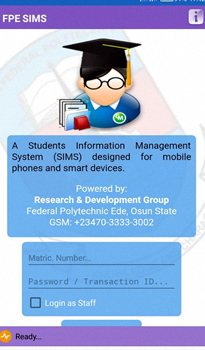 The app is compulsory for both staff and students of Federal Polytechnic Ede. The 2018/2019 Admission Exercise into Federal Polytechnic Ede is NOW OPEN!! !